The 21st Century Cures Act has transformed the US drug development landscape. David Cooney explores the implications of the Act for pharmaceutical companies and reveals how it can be leveraged. The 21st Century Cures Act was signed into law last December during the Obama administration. It brings numerous changes to the US drug development landscape, impacting patients, academia, research institutions, and industry. Over the last number of months Blue Latitude have been engaging with US pharma companies to help our clients understand its implications and how it could be leveraged. In this article, I will focus on the sections of the Act that relate specifically to communication around approved medical products and the impact it could have on the industry. Specifically, I will discuss the changes to medical product communications and how the FDA evaluates promotional materials that present information not contained in the labelling for the product. I believe this will increase collaboration between pharma and analytics. The context for this change in policy is rooted in the evolution of healthcare from a volume to a value based market. For years, the priorities of drug development programmes were to prove the safety and efficacy of a drug in a placebo controlled, double-blind clinical trial that would support application for marketing authorisation. These studies did not take into account the measures of performance requested today around value, such as rate of hospitalisation, cost per quality-added-life-year or patient reported outcomes, as these measures were not a prerequisite at time of trial design. Data illustrating the value of a drug is in high demand today, but repeating completed studies would incur substantial costs the industry is simply not willing/able to incur. Luckily, a lot of this data already exists. It exists in health records, patient registries, and claims databases, which, while uncontrolled, provide a huge sample set. Enter the 21st Century Cures Act – which opens up credible sources of Real World Evidence (RWE) for commercial use to understand and communicate the value of medical products. To be very clear, this is not a yard sale on data! 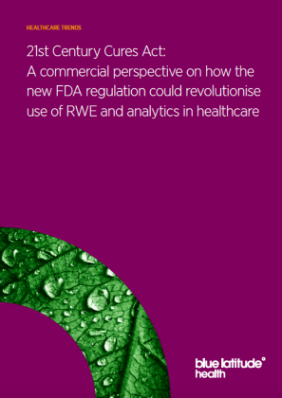 There is still significant rigour required when using RWE commercially and adherence to the product prescribing information is critical. To support industry in determining whether communications about a product are consistent with the product’s FDA-required labelling, a three-factor system has been outlined. If a communication fails to satisfy any one of these factors, it is not consistent with the labelling. Indication – Do the representations/suggestions about the product in the communication relate to a different indication than the one(s) reflected in the product’s FDA-required labelling? Patient Population – Is the patient population represented or suggested in the communication outside the approved/cleared patient population reflected in the FDA-required labelling? Limitations and Directions for Handling/Use – Do the representations/suggestions in the communication conflict with the use limitations or directions for handling, preparing, and/or using the product reflected in the FDA-required labelling? Dosing/Administration – Do the representations/suggestions about the product conflict with the recommended dosage or use regimen, route of administration, or strength(s) (if applicable) set forth in the FDA-required labelling?